It’s a good thing too….because this quilt I cut out last night is unmistakably patriotic. I used every last bit of my red/blue/grey fabrics and lots of scraps. It’s always a little satisfying to completely use up my fabrics…it means they aren’t collecting dust. Except then I have to buy more…which is never satisfying for my wallet. Too bad its so much fun! I always feel sad to use up all of one of my fabrics – it makes me want to buy more to replace it on my shelf lol. I agree tho, fabric is to be used, not to collect dust… but its so hard to see that last FQ or charm square go. I love the 4th of July too! Can't wait to see what you make. Wow, what beautiful fabrics. I always look forward to your colourful posts. loving these colors! especially the addition of the grey! I agree with you, I always like to finish fabrics because I did not buy spare, wasting money. And also because I have a reason to buy more. Yesterday I saw the part of your blog dedicated to tutorials. It's great, thank you very much for having them there and let us visit. Are you making Camille's new pattern Swoon? It has been popping up a lot lately. I need to go buy that pattern! Hahaha, I always consider it a good thing to use up every last bit because then I can shop for more sans guilt. I'm excite to see what you make with that yummy stack of squares! Loving how you arranged the scraps to even resemble a star…. Can't wait to see the final product. Beautiful colors by the way. I was all set to start a new quilt this morning, but now that I see your squares, I may have to pull some reds and blues too! I can't wait to see the finished quilt. I am loving the colors. 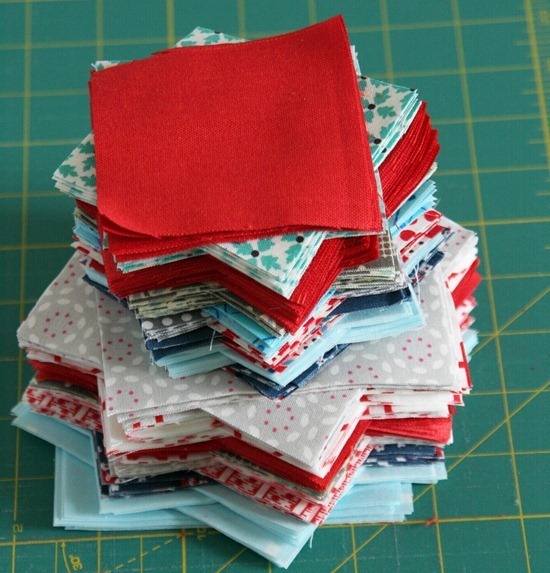 I'm gearing up to make a red, white, and blue quilt, too! Unfortunately, my day job doesn't slow down for the summer until July 8, but I'm hoping to at least pull some fabrics before the 4th. Thanks for the inspiration! those fabrics look so pretty together. Have fun! Great fabrics! Your patriotic sewing post sparked memories of a bathing suit my mom sewed for me back in 1976, it had red and white stripes with blue stars! Pretty colors…look forward to seeing what you create with them!! I can't wait to see what you create; I love the 4th as well! I love those colors. Can't wait to see what you create! Can't wait to see it. Looks like fun fabrics (I love scrap quilts). Have fun! Ooh, those fabrics look awesome together! Me too! I just reserved a TON of turquoise and red fabrics. And, let me tell you, its going to hurt! Being born in July it just naturally happened that I, too, love red, white n blue!! I can't wait to see what your project will be!! I can't wait to see what you end up with! Looks like fun! I can't wait to see your finished product. I love what you said about fabric collecting dust and then you HAVE to buy more! ME TOO!!! I'm almost finished with the snowball table runner! I have to pace myself and sew after I've done a few chores……… It's really hard though! oh my goodness. 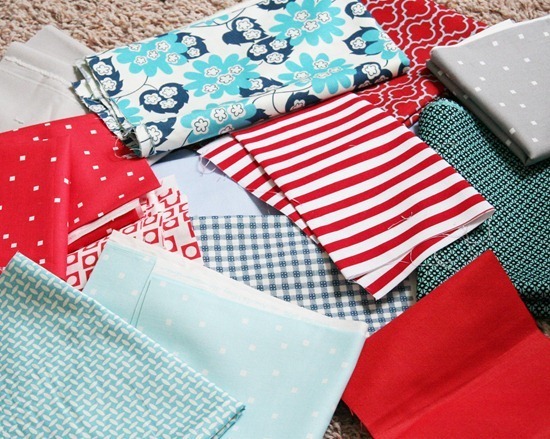 I cut out a very similar pile of fabrics last week for your juice box pattern. A friend loves aqua and red together. I also added gray to try to tone down the patriotic nature of it! Can't wait to see what you do with it. Hi there. Great colour combo. Could you tell us the name of the lovely grey print with circular red dots please? It's beautiful.